Participants will come away with a clear, accessible understanding of what media literacy is in the digital age and why it is imperative that character education, beginning in the family, be integrated across the curriculum for all other literacies to build on. 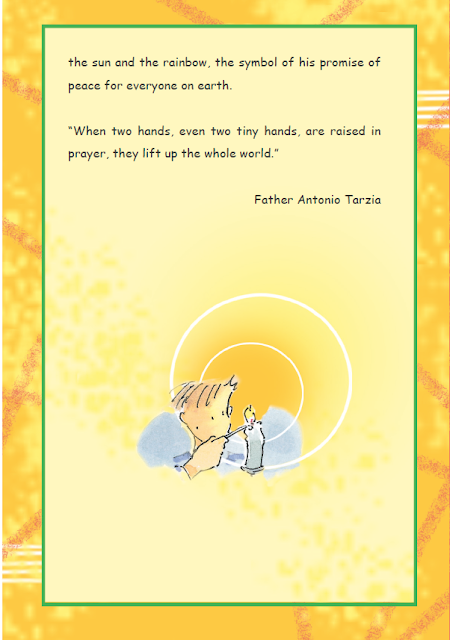 They will come away with practical skills that they can apply immediately in life, faith, catechesis, and education. As catechists, teachers, parents and ministers, it is not enough to know "how." We are called to be faithful citizens in the digital universe and character education is the basic human foundation on which to build the moral, faithful citizen with an informed conscience and vibrant faith life. 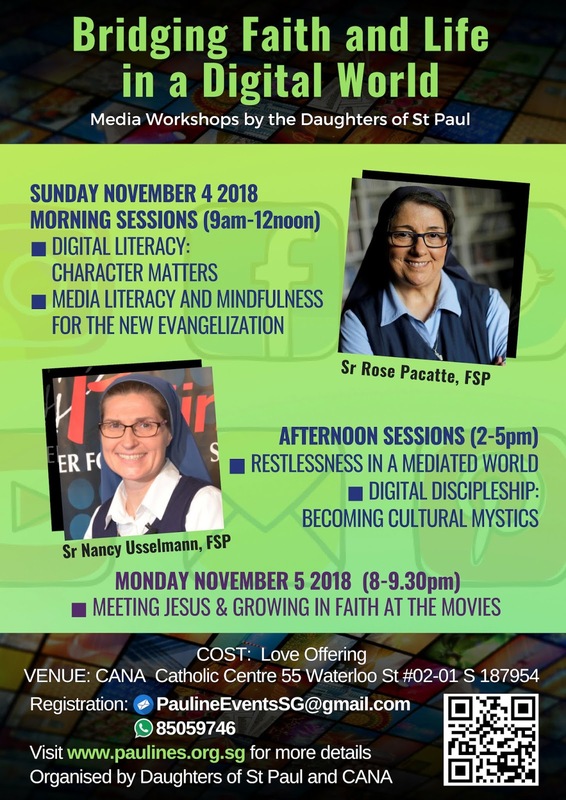 Integrating critical thinking and media literacy within the context of culture, education and faith formation for life and ministry in the era of the New Evangelization. In a media world where we are inundated by endless friend requests and transforming technology we can feel restless while seeking what our hearts most desire. Happiness! What do our relationships really mean? How can I be my authentic self in a digital culture? Faith provides an answer! 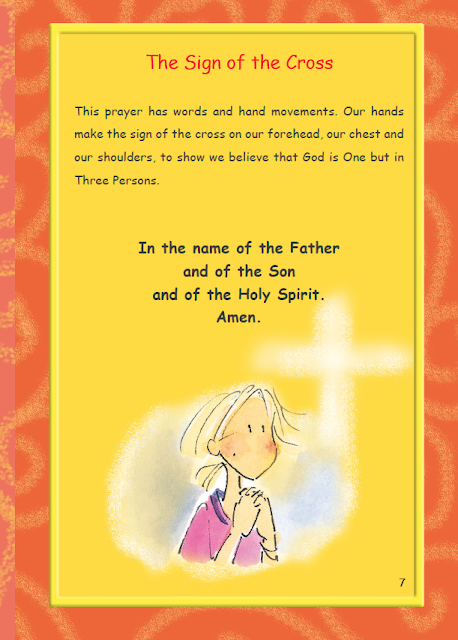 Each of us is called to holiness, as Pope Francis writes. How can we do that in a media culture? Those who look take a sacred look see that art of the culture speaks to the deepest yearnings of humanity and is a conduit for God's grace in the world. Discover your call to be a mystic today! Meeting Jesus and growing in faith at the movies might seem impossible to some. However, this presentation looks at sacramental ways to find God in the dark and secrets to discovering heroes who exemplify the teaching of the Lord Jesus in laughter and tears. Using relevant clips from recent films, Sr Rose and Sr Nancy will look at themes of Catholic Social Teaching and spirituality popular film and offer ways to implement in your spiritual life, family, RCIA and parish community. Sister Rose Pacatte, FSP, D. Min., is the founding director of the Pauline Center for Media Studies in Culver City, CA. She is a media literacy education specialist and an award-winning author and film critic. This is her second visit to Singapore. Sr. Nancy Usselmann, FSP is the current Director of the Pauline Center for Media Studies and a Media Literacy Education Specialist. She has given numerous media mindfulness workshops helping to create that dialogue between faith and media. She is the author of a theology of popular culture called, A Sacred Look: Becoming Cultural Mystics. To help participants embrace media as a gift, and to learn how to interact with media responsibly and wisely (critically from a moral perspective, discerningly from a spiritual perspective) with the tools of media literacy, which would then enable them to grow as persons of wholeness, faith, and holiness, while at the same time, to use media to communicate more effectively, including matters of faith. 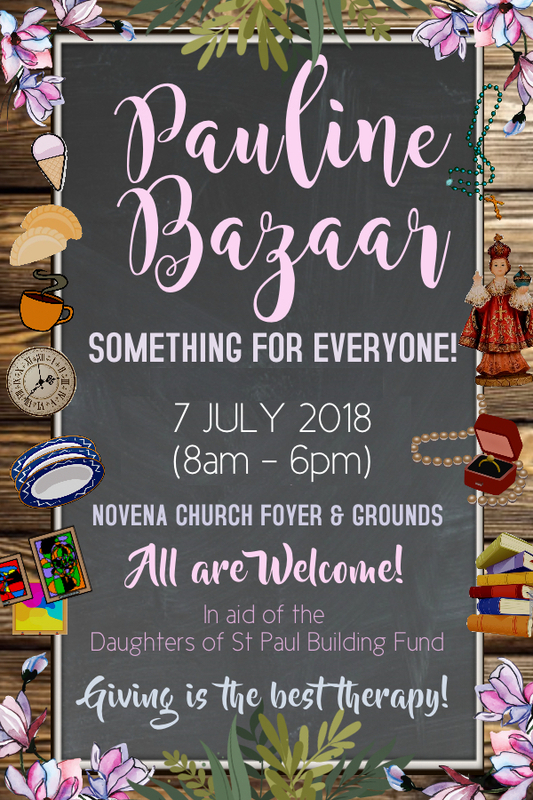 A big shout-out to all who came to support our bazaar over this past weekend in aid of our building fund at Novena Church. Much gratitude to the Redemptorist community, all our kind and generous donors and sponsors, and our awesome team of volunteers and collaborators, some whom spent the whole day with us! (There were many more helpers not captured in pics.) God bless you all!!! Most of all, we thank God for gifting us such fine weather and who continues to bless us abundantly with generous hearts. in aid of our new convent is ongoing. Other inquires, please email us at pauline.fsp@gmail.com for details. With gratitude to God for his love and fidelity, we celebrated the 70th anniversary of religious profession of Sr Lorenzina Nota, fsp, last March 19, 2017. Our thanks to all our kind and generous donors who supported our maiden golf tournament in aid of our new convent! Children who visited Jurong Point Shopping Centre recently had a rare treat as they listened to stories such as the birth of Baby Jesus and the Little Drummer Boy. Mrs Jessie Goh, a Holy Family parishioner, enthralled them with these and other stories on Dec 18, as part of an outreach by the Daughters of St Paul. For over 15 years, the nuns have conducted an annual Christmas outreach at the shopping centre, entitled Bringing Christ to the Marketplace. During this period, they make their spiritual books and media materials available at a push-cart, in the hope of also reminding shoppers that Jesus is the real reason for the season. This year, the nuns extended their outreach with an afternoon of storytelling for children conducted in two sessions. Mrs Jessie Goh, a storyteller with the Storytelling Association (Singapore), started each session asking the children what Christmas meant to them. The Daughters of St Paul Christmas outreach kiosk at the shopping centre. She then told them the story of the birth of Jesus, followed by the story of the Little Drummer Boy, who had nothing to give Baby Jesus except his gift of drumming. Here she invited the children to discover the joy of sharing the gift of their talents. Her final story was about a school which invited its students to fill up shoeboxes for the poor. One little girl, who was poor herself, nevertheless gave her father a shoebox at Christmas. When he opened it, he found it empty. But when he asked if it was a joke, she replied that she had filled it with all her love. 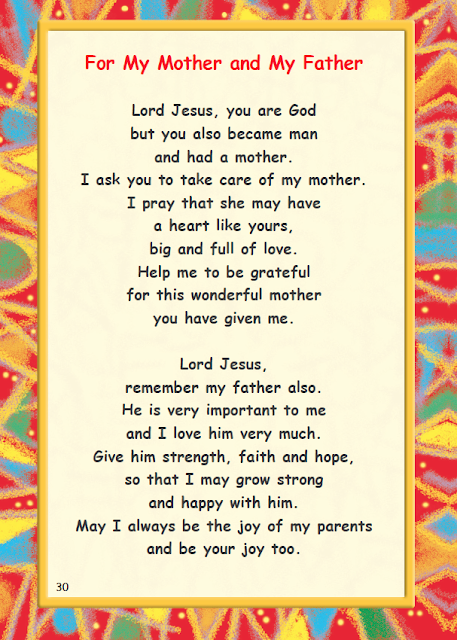 The children were thus reminded that love is the greatest gift of all. The session ended with the kids folding a piece of paper into the shape of a heart, which they could give to their parents. The children, who numbered between 20 and 30 for each session, also received a paper cut-out gift from the mall and chocolates from the Sisters. Proceeds go to our building fund. Thank you for your kind support. 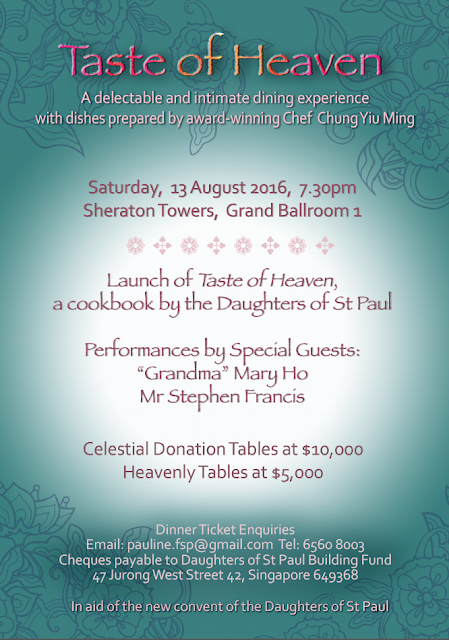 Sisters Serve Up "Taste of Heaven"
will be given as a gift for donations of $20 and above. UPDATE: THIS IS CURRENTLY OUT OF STOCK! WE THANK YOU ALL FOR YOUR WONDERFUL SUPPORT! THANK YOU for your wonderful support for the past year. 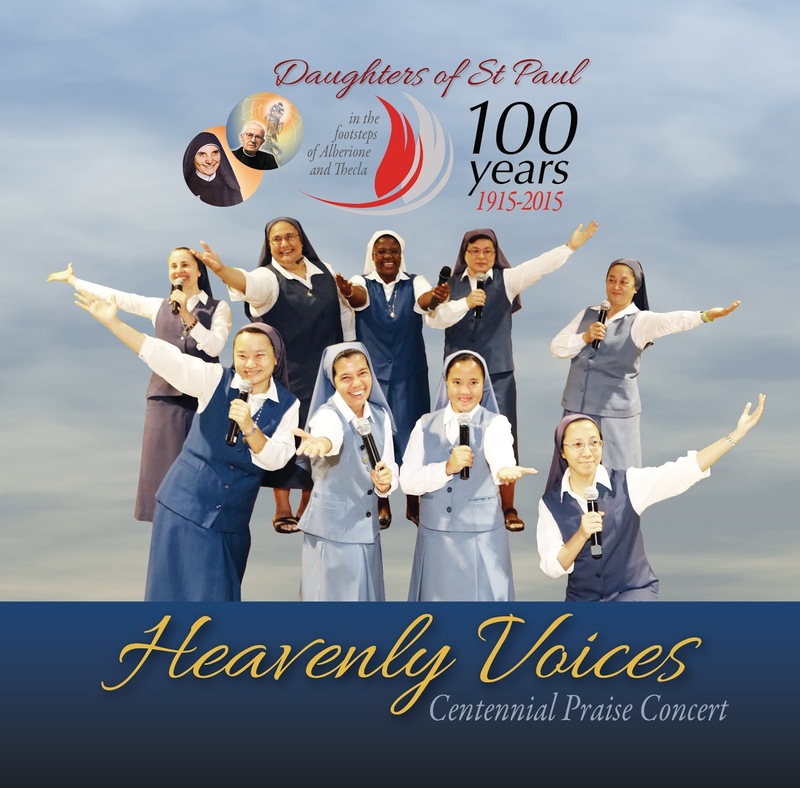 featuring Daughters of St Paul from around the world. 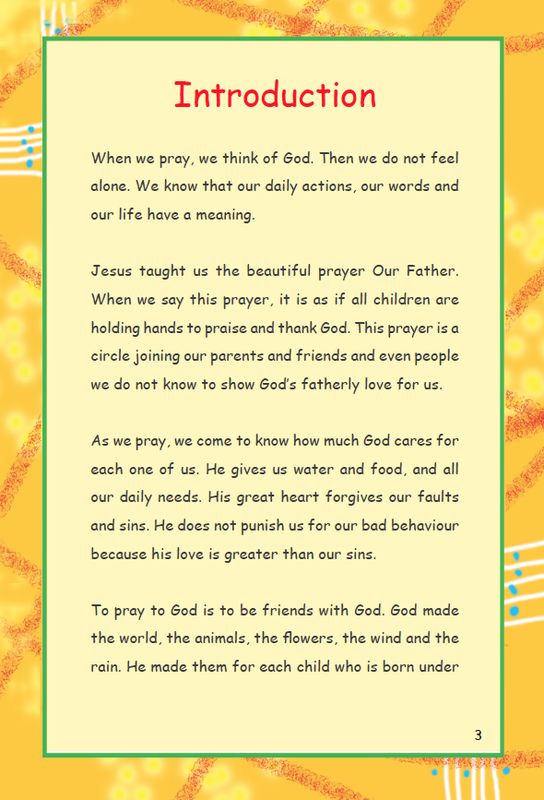 Performed by Sr Jocelyn Kwek, fsp, Sr Wendy Ooi, fsp and Sr Aeran Kim, fsp at our fund raising lunch at Tim Palace, SAFRA-Toa Payoh, Singapore on Sunday Aug 10, 2014. 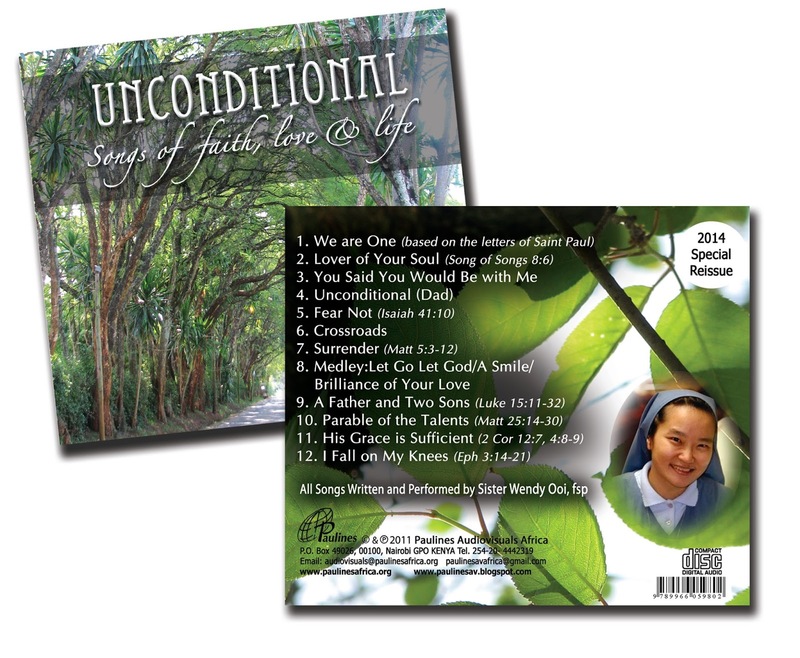 "We are One" is the first track from the CD, "Unconditional" which is available for a minimum donation of S$10. 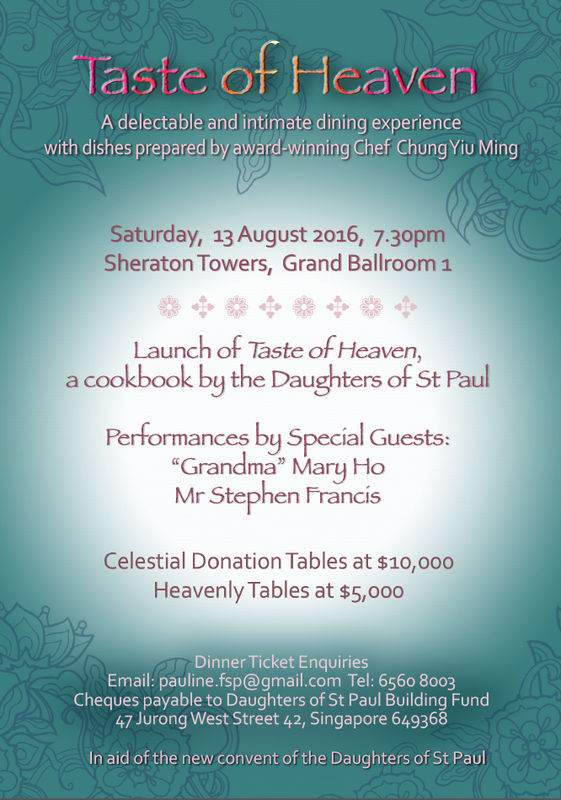 All proceeds go to the Daughters of St Paul Building Fund in Singapore. 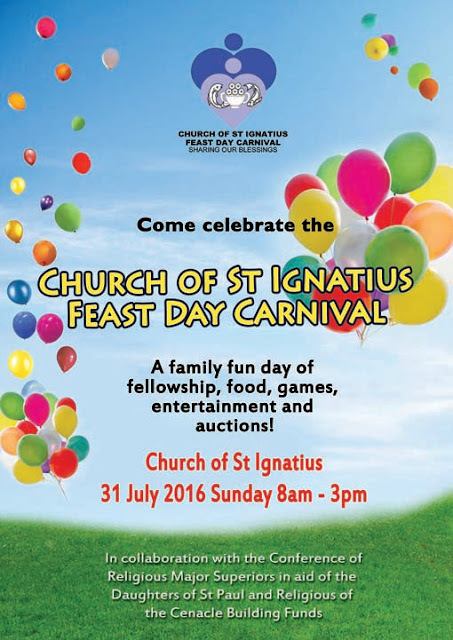 Also available at Apostolate of the Media, Church of the Risen Christ, Toa Payoh. "When two hands, even two small hands are raised in prayer, they lift up the whole world." My prayers to God with Love and Joy is a colorful and handy pocket-sized prayer book for children aged 6 and above. 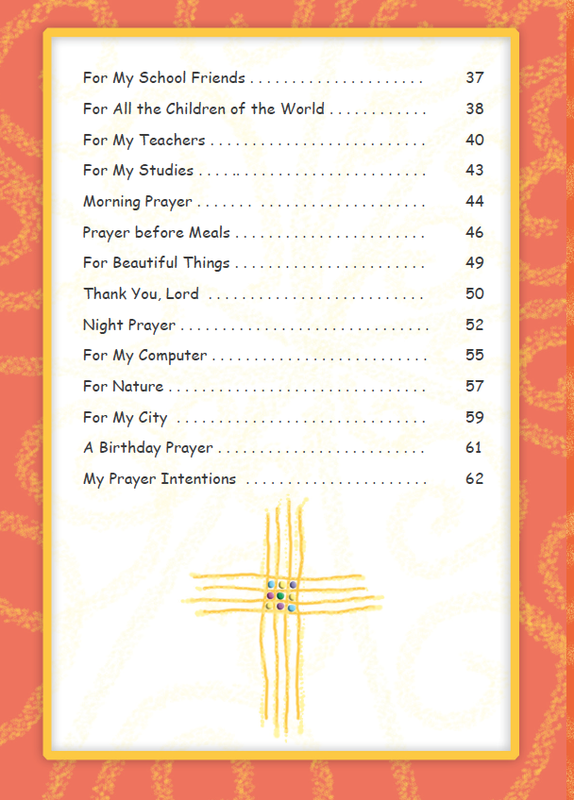 It contains original prayers which touch on family, friends, play, study, teachers, computers, birthdays, nature and more. Morning and night prayers as well as thanksgiving prayers are also included. 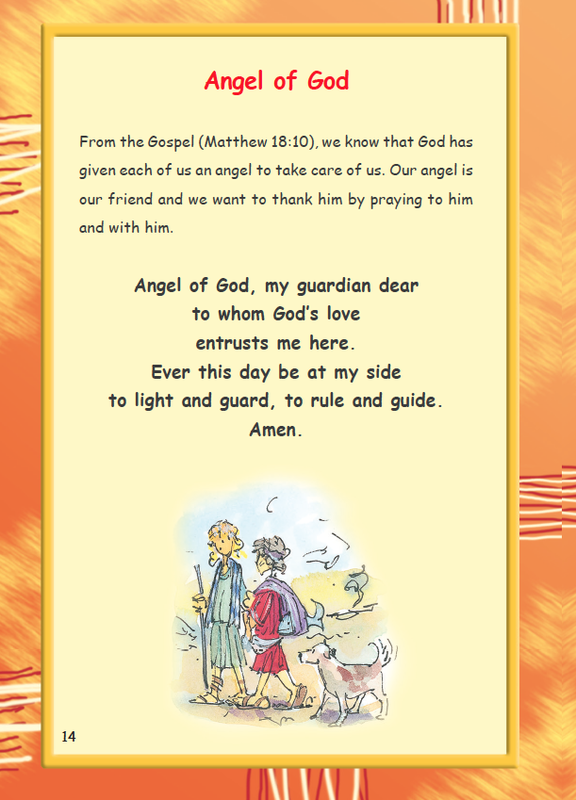 Written in a simple and spontaneous style, these prayers encourage children to speak personally to God about their concerns. 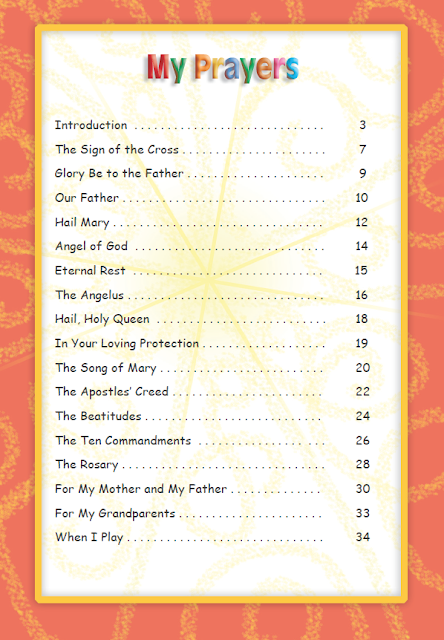 Brief and clear explanations on the Beatitudes, Ten Commandments and the Rosary complete this prayer book. To pray means to be friends with God, to know him better and to grow closer to him. 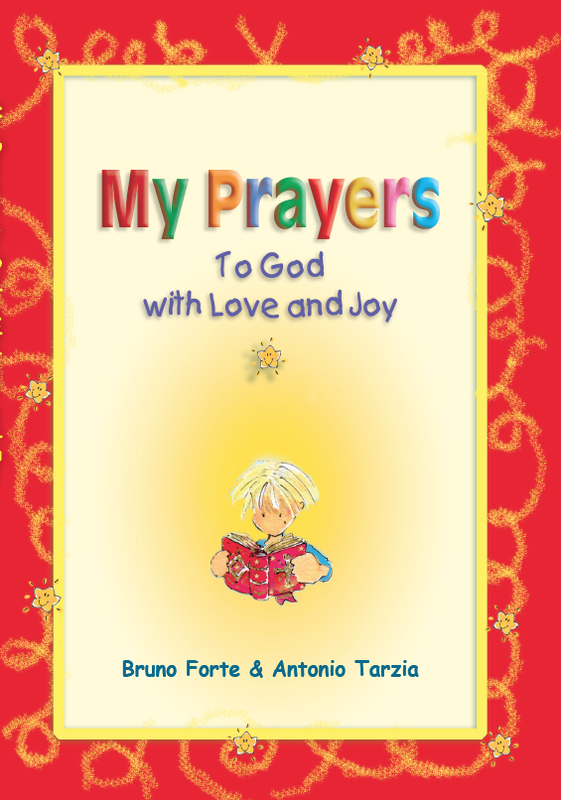 My Prayers to God with Love and Joy will inspire children to love prayer and deepen their relationship with God. It also makes a wonderful First Communion gift. Priced at S$6.50. 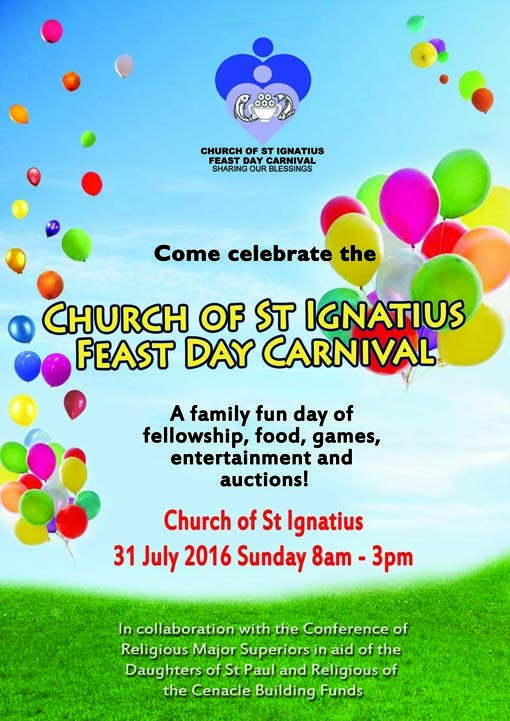 Available at Apostolate of the Media (tel 63565958), Church of the Risen Christ, Toa Payoh. For orders, please email pauline.fsp@gmail.com with your name, contact number, address and quantity required. The world is continually changing, and the Daughters of St Paul, an international community of religious women, has made it its mission to propagate the Gospel using modern forms of communication. In doing so it has needed to acquire the skills necessary for working with modern media, from a knowledge of studio recording methods for producing CDs and DVDs through to the computing skills necessary for developing websites and establishing a presence within social media, such as Facebook. 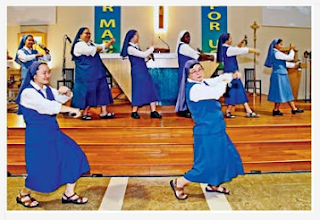 A new type of nun is clearly required for such work, and one such person is Sister Wendy Ooi, the author of Notes from Kenya, who, some years ago, left her work with the Singapore Broadcasting Corporation to take up her vocation with the Daughters of St Paul. Sister Wendy’s most recent posting, five years ago, was to Nairobi, the capital of the East African country of Kenya. 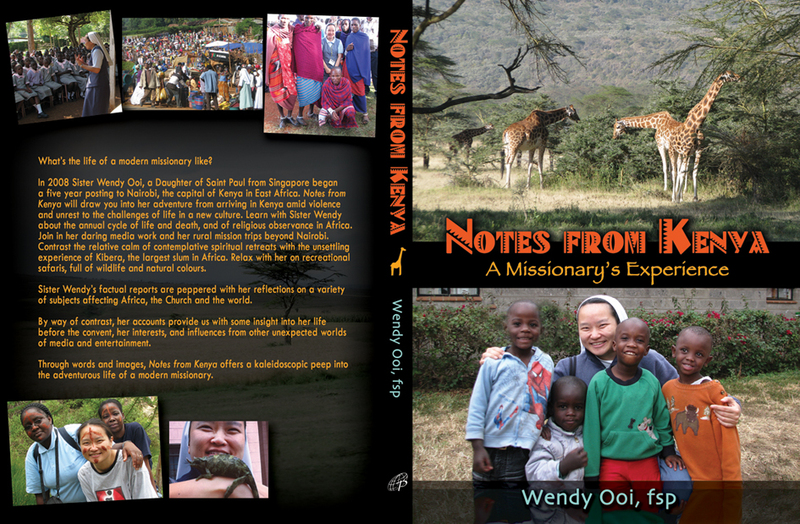 During her time there she kept in touch with distant friends and colleagues through the medium of an on-line ‘blog’, or diary, as a means of letting them know what she was doing, and that blog forms the basis for her book, Notes from Kenya - A Missionary’s Experience, now embellished with additional photographs and text. The focus of Sister Wendy’s work in Nairobi was working for the audiovisual or ‘AV’ sector of the Paulines, and she describes in the book the production of CDs like the Heart of Peace, a collection of peace songs produced in response to the regional violence there, and the production of DVDs on subjects such as the Stations of the Cross and the Parables. But this book, far from being a dry description of Sr Wendy’s working routine, provides a complete and colourful picture of all aspects of her life throughout her five years in Kenya. She describes the relationship between the convent and the local community, with subjects ranging from outreach work in nearby villages through to the sometimes surprising cultural differences that she encountered in attending gatherings like local funerals. She doesn’t shy away from discussing difficult subjects, with reflections on the extreme tribal violence that was widespread on her arrival in Kenya, the kidnappings of fellow Sisters and the murder of a Priest, and the extreme poverty faced by locals on Nairobi’s doorstep, in the Kibera slum. Scattered throughout the book are Sister Wendy’s reflections on her cultural and religious influences, from literary figures of the past through to contemporary performers like Suzanne Vega. Sister Wendy experienced her own taste of fame when, after producing one CD, Unconditional, she found herself mobbed by admirers in search of her autograph! During her time in Nairobi she would make a point of meeting up with fellow ex-pats and, by chance, VIPs - Prime Ministers, Ambassadors and Nuncios included - to celebrate Singaporean and Malaysian National and Independence days, and a feast of a time was had by all. On the few occasions when she was able to take leave from the convent Sister Wendy took the opportunity to venture away from Nairobi, on safari in the Great African Rift Valley. The book is lavishly illustrated with over three hundred of Sister Wendy’s personal photographs, many of them covering the wildlife and landscapes that she encountered on those expeditions. 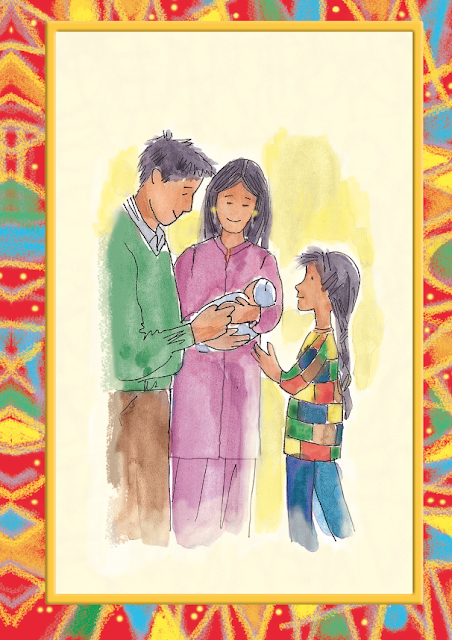 The book has been designed by Sister Wendy herself, and the care with which she has created it, with special African-themed graphics throughout, has resulted in a book that is a pleasure to behold.